In some cases your doctor may refer you to Dr. O'Neill for a consultation. Dr. O'Neill will see you in his office and will do a comprehensive evaluation of your medical history, perform a physical exam, and personally look at your imaging studies. He will work with you and your referring doctor to make sure that you get the best treatment possible. In other cases, you and your doctor may have already decided that a spine injection or other interventional procedure would be useful. If so, we will schedule you for the procedure your doctor has requested at one of the facilities where Dr. O'Neill works. Dr. O'Neill will meet with you, look at your imaging studies, do a brief evaluation, and make sure that all your questions are answered prior to your procedure. 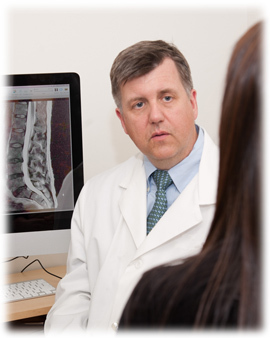 The first step in treating the chronic spine pain is to make a diagnosis, which starts by listening to the patient. Dr. O'Neill evaluates the medical history, performs a physical examination, and evaluates imaging studies before recommending treatments or performing procedures. MRI, CT, or other imaging studies in most cases help to make a diagnosis. While the results can provide important information, they do not always explain causes of chronic pain. Many people with abnormalities on their imaging studies such as degeneration, arthritis, and herniations do not have any pain, while some people with normal imaging studies have severe pain. The medical history and physical examination are crucial in deciding whether things that we see on radiology studies are causing pain. When the diagnosis is not clear, diagnostic injections may be useful. This involves putting a needle into a part of the spine and observing the effect on your symptoms. If a structure in your back is very tender when we inject it, or if pain subsides after a structure is numbed up, they may be the cause of your pain. Once a diagnosis is established, the second step of treatment can begin. Among the treatments for chronic spine problems are physical therapy or other types of rehabilitation, medications, injections or similar interventional procedures, and surgery. Spine injections and other interventional procedures can be performed on various structures (joints, discs, nerves), and in several regions of the spine (cervical, thoracic, lumbar, or sacral). Most injections are done with a combination of local anesthetic (numbing medicine) and cortisone (steroid). Cortisone is a naturally occurring substance that treats inflammation, which is often the cause of pain. While some people are concerned about cortisone, when given occasionally by injection, it is a very safe treatment. Pain relief from cortisone injections can last anywhere from months to years. Pain relief will enable you to undergo treatments, such as physical therapy, to rehabilitate your back. Numbing medicine (local anesthetic) is usually injected along with cortisone. Local anesthetic injections can only relieve pain for a few hours. However, the amount of pain relief that occurs when a structure is numbed up can be very useful in making a diagnosis, which may then lead to better long-term treatments. The spine is made up of several bones, and all of them have joints between them. Some joints like the facet joints and the sacroiliac joints can become irritated and cause pain. Facet joints are little guiding joints in the back of the spine. Irritation of the facet joints can cause pain anywhere from the neck to the low back. Sacroiliac joints are large joints that connect the spine to the lower body. Sacroiliac joint problems usually cause pain in the low back and buttocks. Spinal joints are usually injected with cortisone to reduce inflammation and to relieve pain, and numbing medicine (local anesthetic) to help confirm a diagnosis. Because there are so many joints in the spine, several injections may be required to pinpoint the pain source. The epidural space is a compartment in the vertebral column that contains the main nerves of the spine. Nerve irritation from disc problems and/or arthritis can be treated by injecting cortisone into the epidural space, which will then spread around the nerves. Examples of epidural injections include transforaminal epidural steroid, and inter-laminar epidural steroid injections. Discs help to form the main joints of the spine, and can frequently become painful. Discography or CT/discogram is used to diagnose disc pain. It is not meant to provide pain relief. During discography, pressure is applied to the disc by injecting dye into it. When this pressure results in pain, it means that the disc is tender and may be causing pain. This procedure is usually followed by a CT scan at a nearby imaging facility. Discography is reserved for patients who have not responded to medications and conservative treatments and for whom the possibility of lumbar (lower back) surgery is being considered. Rhizotomy procedures are considered when joint injections help relief pain but do not last long enough. This procedure relieves pain by using an electric current to create a highly localized heat, destroying the nerve that carries pain signals from the joint. When rhizotomy is effective, the relief typically lasts for a year or more, and the procedure can be repeated. Discs sometimes develop herniations. They are bulges of the spongy central part of the disc that extend into the spine, where the nerves are located. Herniations sometimes cause pain by putting pressure on a nerve, but more commonly cause pain by creating inflammation around the nerve. In most cases the body will heal herniations on its own. An epidural or nerve injection can help the healing process. If healing does not occur naturally, a percutaneous disc decompression can be considered. Nucleoplasty is one way of doing this decompression. It involves putting a small electrode into the disc and applying energy to remove some tissue, decreasing pressure and inflammation. The function of sympathetic nerves is to control blood flow and sweating. Sometimes, after an injury, they can also cause pain. A sympathetic injection is an injection of a local anesthetic (numbing medication) around a group of sympathetic nerves. Cortisone is not used for these injections. The most common sympathetic injections are stellate ganglion injections in the neck and lumbar sympathetic injections in the low back. These injections decrease pain and increase the circulation and blood supply to the affected area. Pain signals travel along nerves, which can become irritated by a number of different spinal problems. In many cases, cortisone (steroid) injections around a nerve can reduce inflammation and relieve pain possibly for months to years. In other cases, local anesthetic injections provide pain relief for a few hours. Additionally, they can help with a diagnosis towards long-term treatments such as a rhizotomy or surgery. Nerve blocks can be done where the nerves exit the spine (known as selective nerve root injections) or at other places in the body (e.g., facet nerves, femoral nerves, and occipital nerves).